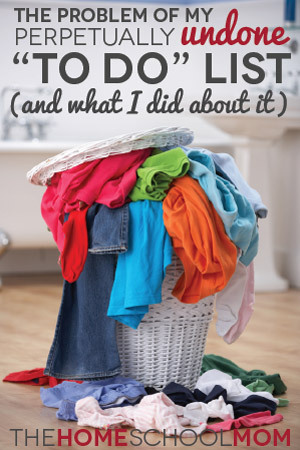 When my kids were little I’d make a list of things that needed to get done. Very rarely did I ever feel like I was accomplishing anything on the list, and almost always, I was correct — I did very rarely ever accomplish anything on the list. But, looking back I realize that not doing those things on my list that I felt “really needed” to be done didn’t cause anyone any pain, make anyone sick, or otherwise cause any long lasting effects. Usually, there just came a point where the critical due date for each item came and went with no ill effects, and it just fell off the list. When I look back now, I realize that what I was doing with my time was taking care of and loving my kids, and taking care of myself, and often just trying to keep my head above water. BUT, really those are the things that truly NEED to be done. If you don’t get to washing clothes, it’s not the end of the world — the kids can wear dirty clothes, or if you’re at my house, nothing but underwear. (I’m thinking that there may be a day that my boys will wear clothes at home, but when at 13, 16, and 18, the first thing they do when they get home is strip down to their underwear, I’m not sure if it’ll ever happen ;). ) If you don’t get to mowing the grass, it’ll just get longer, it’s not going to stage a revolt. If you don’t get to the grocery store to get that item on sale, it’s OK, it’ll still be there later. However, if you don’t love your kids, don’t allow yourself to give them the time they need when they’re little, you will regret it in the long run. So, now, as I’m looking at my living room that really needs to be straightened up and the huge pile of mulch outside my window that really needs to spread in my garden, I realize that my boys wanting me to take them to the park this afternoon will take precedence, and that it’ll be OK.
My oldest just graduated and will be leaving home this fall to travel overseas and my other two are getting older and more independent as well. My relationship with my 16 year old is such that he’ll still grab my hand when we’re walking out in public, and he’ll give me a hug and tell me he loves me in front of his friends. My 13 year old is one of the most generous kids I know. The days when they’ll be here for me to enjoy their company are limited, so after all these years I now realize that it’s OK that I let all the must-dos and need-to-dos slide, because I was doing the MOST important thing. I know it’s hard when you’re in the middle of it. I really DO remember. And, it’s hard when YOU feel like you should be doing more. It can be harder when you’re getting outside pressure from your husband or others that you love to do more, but it’s OK.
For me, I often felt the most pressure from my husband. Not because he was doing anything to make me feel pressured, but because I felt like I owed it to him to keep the house better than I felt capable of. I felt like I was taking his needs for granted. I worried that he’d think that my letting things slip meant that I expected him to pick up the slack, but I didn’t. He probably did often feel like I should be doing more around the house, and while those things were on my list, they didn’t get done. One thing I did that helped was to share with my husband that I just didn’t feel capable during this phase of our children’s lives to do everything that needs to be done. I asked him what the one area that matters the most to him was and told him I’d do my best to focus on that one thing. (For him it was making sure his laundry was done so he’d have clean clothes for work– so I made a concerted effort to wash, dry and then lay out his clothes when I removed them from the dryer so they weren’t in a heap waiting to be folded– because I never did get to folding.) I told him my inability to get things done didn’t mean that he needed to do them, and although I did appreciate any help he wanted to offer it was OK for him to let them slide as well. Talking to him really did help. He realized how overwhelmed I felt and how I was doing my best to get done what I could. He did pick-up some of the slack on things that he cared about. Many things did slide, but everything was and is OK.
Karen Evans (a pseudonym) lives and homeschools her 3 sons in North Carolina.